The Bairairrai, around 1976. Photograph from the Trust Territory of the Pacific Archives. The following chronology is drawn from Micronesia: A Guide through the Centuries. This excellent resource, produced by the Close Up Foundation, contains detailed, multi-layer chronologies for all five U.S.-affiliated Micronesian entities. Here, we have abbreviated and adapted their information, and added data specific to Airai, to highlight events of importance to the discussions on this website. Shipwreck of Captain Wilson on Ulong reef. Visits by Western ships begin after his return to England. Many Palauans die from introduced diseases, such as smallpox, influenza and leprosy, brought by passing ships. Various European traders come through, including captains Cheyne, Soames, Nail, and Woodin. They trade mainly for trepang, coconut oil, and turtle shell. Bilung, Ibedul's sister, marries Reklai to seal the peace between Melekeok and Koror. The peace does not last, however. Cheyne is killed by Ibedul's men after he had established relations with Reklai to buy land on Babeldaob. German Alfred Tetens takes over his trading stations. James Gibbons, an educated West Indies native, jumps ship and settles in Koror, where becomes a major go-between for passing ships. Polish-born scientist Johannes Kubary arrives to study Palauan culture. A severe influenza epidemic comes after the departure of the ship Suzanne. Palauan women have chosen to have very few children, for reasons unknown. Captain O'Keefe brings Yapese to quarry stone money. The Pope declares Spanish rule over Palau, though British and German trade is permitted. Spanish missionaries reach Palau in 1886. Warfare ends between Reklai and Ibedul. Spanish Capuchin priests arrive as the only representatives of the Spanish government. In 1898 the Spanish-American war begins, and in 1899 the Spanish sell the Caroline and Mariana islands to Germany. German marks become the currency in Palau. James Gibbons opens a jail in Koror and serves as chief of police. Coconut stock for planting arrives, and by 1904 over 40,000 trees have been planted all over Palau. Copra becomes the leading export. Spanish missionaries are allowed to return. 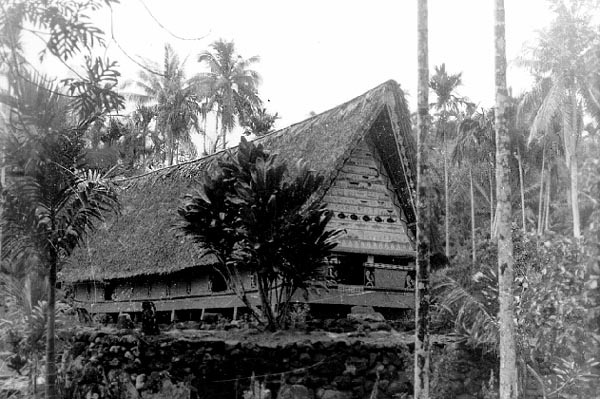 The Germans outlaw the practice of omengol, wherein women provided services at Palauan mens' clubs. They also introduce a spelling system for Palauan language. Winkler arrives to be station supervisor for the German administration. Phosphate mining on Angaur begins. German scientist Augustin Kramer arrives to study Palauan culture for ten months. A mission is established in Airai by German catholic priests. As part of the Allied forces of WWI, Japan takes military control over Palau and much of Micronesia. All Germans have to leave Palau. Palau becomes one of six administrative districts in Japanese Micronesia, and a policy is established that no one except the Japanese government can buy land in Palau. The Modekngei society is established by Temedad. This is a religious movement to bring back the ancestral gods and bring the people of Palau together. It is seen as a threat to Japanese authority. Treaty of Versailles marks the end of WWI, 1920. A year later, Spanish missionaries return to Koror. The League of Nations officially places Palau under Japanese control, and Japanese Micronesian headquarters are moved from Chuuk to Koror. Estimated population in 1920 is 5,700 Palauans and 600 Japanese. Buddhist and Shinto religions are introduced by the Japanese. Causeways are completed that connect Koror with Malakal and Ngerekebesang islands. The first schools for Palauans, up to the third grade, are opened. Japanese art teacher Hisakatsu Hijikata introduces the idea of taking the story-telling artwork done of the tie beams in the bai and creating separate, individual "storyboards" as art. Japanese development of Palau continues with urbanization of Koror, agricultural experiment stations, phosphate and bauxite mining, and the construction of airports (on Peleliu and Angaur) and seaplane ramps. Japanese Airways Company flies the first commercial air service to Palau in 1939. By 1940, population is estimated at 7,000 Palauans, 23,700 Japanese. World War II: Peleliu becomes headquarters for Japanese 31st Army. Catholic priests are executed. U.S. warplanes start bombing Japanese military installations on Koror and Babeldaob. U.S. forces invade Peleliu in a battle that claims about 1,700 American soldiers and 11,000 Japanese soldiers. Japanese surrender. United States takes control of Palau, with the Navy in charge. Most Japanese in Palau are sent back to Japan. The Trust Territory of the Pacific is mandated by the United Nations, with Palau as one of six districts. The TTPI is administered by the United States. The Palau Congress is established to advise the TTPI government. Five Palauans, including Roman Tmetuchl of Airai Village, become the first to attend schools of higher education overseas. TTPI government is transferred from the U.S. Navy to the U.S. Department of the Interior. Immigration Act requires Palauans to get immigration documents to enter the U.S. (including Guam). The Obliil Era Kelulau Era Belau (Palau Congress) is chartered. Palau establishes charters for the 16 municipalities ("villages"). First traditional women's convention is held. The Belau National Museum opens. American contract teachers are sent to Palau. Bank of Hawaii is established to enhance economic development. Two political parties form—the Progressive Party and the Liberal Part—representing different positions on the future of Palau. Peace Corps volunteers (1966). English becomes the language of instruction throughout the TTPI in 1967. Typhoon Sally destroys much of Koror and does serious damage on Peleliu and Babeldaob, 1967. Micronesian Future Political Status Commission is established, with Palauan Lazarus Salii as its chairman. Babeldaob airport is completed in 1968, and Continental Airlines begins commercial flights. Micronesian Occupational College (MOC) opens in Koror as a vocational school. Thomas O. Remengesau becomes first Palauan to serve as District Administrator, the highest post in Palau. New school code for TTPI leads to Palau's first Board of Education meeting. Several American universities start offering educational courses in Palau. David Ramarui of Palau becomes first Micronesian director of education for the entire TTPI. Roman Tmetuchl becomes first chairman of the Palau Political Status Commission that presses for separation from Micronesia. The first Koror-Babeldoab Bridge opens. Palau and the Marshalls vote against a constitution to created a united Federated States of Micronesia. Thirty-eight delegates meet in a Constitutional Convention to write a Constitution for the Republic of Belau. New Palau Constitution is ratified by 70% of voters. Haruo I. Remeliik and Alfonso R. Oiterong are elected President and Vice-President. President's office is bombed during a period of strikes in Koror. Blau Skebong's entry wins the design contest for the national flag, and Ymesei Ezekiel, well known Palauan composer, writes national anthem. New Palau International Airport opens. Airai is one of three states to form constitutional governments. Palauan music industry begins to develop during the 1980's, with a new style. Palauan citizens vote on Compact of Free Association with the U.S. It gains 62% of the vote. Palau Supreme Court declares Compact invalid since it did not reach the 75% majority required by the Constitution. Second vote garners only 67%. First Palauan-owned bank starts operation with Roman Tmetuchl as president. President Remeliik of Palau is assassinated in front of his house in Koror. Alfonso Oiterong becomes acting President, then Lazarus Salii is elected Palau's second President. TTPI is ended with the establishment of the Federated States of Micronesia, Commonwealth of the Northern Mariana Islands, and the Republic of the Marshall Islands. Palau remains the only Trust Territory. Four more votes are held on the Compact, none meeting the 75% requirement. President Salii found dead from apparent suicide. Ngiratkel Etpison is elected President. Palau declared a disaster area when super-typhoon Mike hits Kayangel and northern Babeldoab. Seventh vote on the Compact fails. Palau Board of Health is created. Belau National Museum initiates first Belau Arts Festival. Voters pass amendment to the constitution changing the 75% majority requirement about nuclear material to simple majority (51%). Voters approve the Compact of Free Association by a 68% majority. Palau officially becomes independent and joins the United Nations as the 185th member. Palau Conservation Society is chartered as first non-governmental environmental organization in Palau. Noah Idechong is elected Founding President. MOC becomes Palau Community College (1993). First Women's Conference is held, focusing on Palauan culture and tradition. Noah Idechong is one of six people worldwide to win the Goldman Environmental Award for his work on protecting Palau's reefs and fisheries. President Nakamura switches on Palau's first two traffic lights. Palau joins the opposition to French nuclear testing in the Pacific. Koror-Babeldoab Bridge collapses, killing two people and injuring several others. The channel between Koror and Airai is closed to all boats during construction of temporary bridge. Land Claims Reorganization Act takes effect to speed up the land claims process. A Japanese-funded project provides electrification for all the states of Babeldoab. Palau International Coral Reef Research Center is established. Johnson Toribiong is selected to follow Roman Tmetuchl as Ngiraked of Airai. New Japan-Palau Friendship Bridge opens between Koror and Airai, replacing the old K-B Bridge.